In that heavenly area close to Wenceslas Square, I resumed, once again, my never-ending survey of Prague's hamburgers. I went to Restaurace Jama, which means "the hollow" a couple of times recently. The place is quite popular with expats, though I rarely go myself. I'd heard boasts about the burgers over the years. Regarding the vaunted Jáma Burgers, I have good news and bad news. More on that later. Jáma is a big place, and it is often pretty full. Drinking is a common pastime. 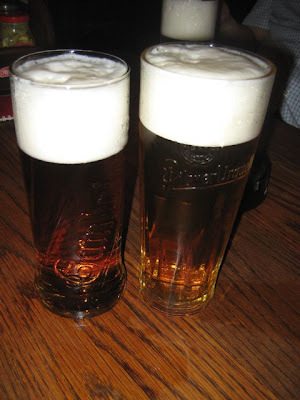 A half-liter of Pilsner Urquell was 45 CZK. Gambrinus was 35 CZK. Kozel dark was 35 CZK, and Kozel light was 29 CZK. I should note that the prices listed here should be correct but, as of this writing, the prices on the Internet menu were not up to date. 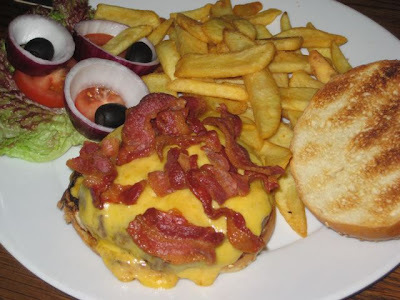 On my first, I had the world's most popular of burger combination, the bacon cheeseburger. But, I had to wonder why the menu offers a bacon burger (175 CZK) and a cheddar burger (175 CZK), but there was no combo. To achieve full bacon cheeseburger status, you have to order one of the above burgers, and then add extra cheddar (45 CZK) or extra bacon (45 CZK). This annoyed me. I was also irked that a slice of cheese cost the same price as the bacon -- a mind-boggling 45 CZK. Regarding the bacon itself, it seemed that the chef took a little shortcut. The strips had the tell-tale signs of being deep fried rather than pan fried. A friend who worked at a snack bar once told me about this trick. The bacon cooks much faster, but comes out with a dried out, brittle texture. I have also have a beef with the onions served on the side. What are they thinking, slicing them that thick? When you put them on the burger, they create an airy loft space under the bun. There was also lettuce, tomato, and oddly, black olives on the side. You can have fried onions for an extra 10 CZK, which I presume would not raise the roof as high as the raw ones. The menu said the burgers came with fries. But later, I saw there was a 10 CZK charge that said "hranolky (fries) plus." I'm not sure why. Yes, there is some good news. The beef patty was thick, well-shaped, juicy, and held together well. There could have been a little more seasoning. The bun was large, sturdy, and perfectly-sized for the meat. It was nicely toasted. The steak fries were hot, crunchy, and there were plenty of them. It was all very filling. On second visit, I decide to try the Jack Burger, made with Jack Daniels barbecue sauce (195 CZK). I don't know what I was thinking. This was a mistake. That's because the plain, classic burger cost only 150 CZK. I don't see how they could justify the 45 CZK premium for the small amount of sauce unless this liquid gold was hand-carried from the USA on a first class flight. And I could hardly taste it. A big disappointment. I should have tried the chili burger. 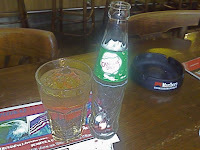 I noticed they had Canada Dry in the fridge, so I ordered a bottle (30 CZK). Unfortunately, it doesn't taste quite the same to me as the Canada Dry ginger ale in the states. It had a slightly saccharin flavor. Jama had other offerings besides burgers. 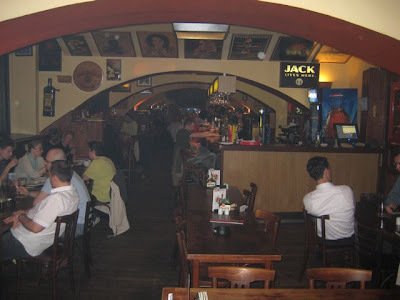 There were burritos (155 CZK), Czech beef in cream sauce (159 CZK), and ribs (155 CZK). I saw they started making something called an "orange drop" chimichanga. I'm not sure what that is, but I'm intrigued. I probably will try the Tex-Mex options some day in the future. The burgers have so much potential, but the puffed up pricing, odd onion slicing, and bad bacon put me off. They get the big things right. But to my mind, they got too many of those slight, but devilish details wrong. Wow. So that's $2-$3 for beer, $3 for a slice of bacon, $3 for a slab of cheese. And $3 for a dollop of JD BBQ sauce, of which you can buy an entire (smallish) bottle at Tesco for $9. I've been disappointed with Jama's burgers a few times as well but I've always enjoyed their steaks, chicken quesadillas and nuclear wings. 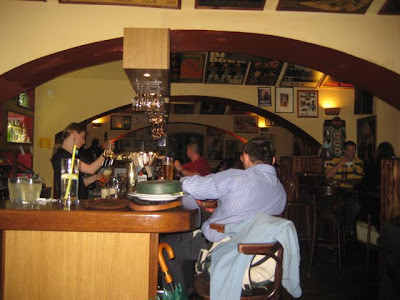 Jama is my favorite place in Prague. The food's great, the company is stimulating and you can't beat the ambiance. First class service too! I think our dear blogger is too focused on the little things, like the onions. If he's looking for the Mcdonald's experience, he's at the wrong pub! I've been going to Jama since it opened in '93 (right?) 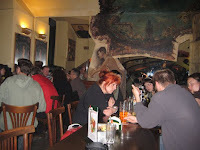 and am generally happy with their burgers today (they seemed heavenly all those years ago, but there is lots of worthy competition these days -- see http://czechoutchannel.blogspot.com/2008/02/burgers-of-prague.html). I actually find the 10 kcs for fried onions a bit of a bargain. I expect a few fried onions for my 10 kcs (as the blogger rightly points out, the bacon is more expensive than that for just a couple of strips), but get a whole mound of them on the burger. I have to remove about 90% of them to a separate plate before I can eat the burger. Still, quite tasty (and I agree, avoid the bacon, though it's not a money issue). I am not particularly a fan of some of the other (non-burger-related) menu items, however. Service is normally first-rate; Max trains the staff well. Again, Jama's been here since about '93, and has been famous in particular for it's burgers since then; they must be doing something right. Hello, I am Max Munson, the owner of Jama. I have just read with interest the article on our burgers, and all of the comments. The reviewer had plenty of valid points concerning our burger, as did many of those who left comments. Why would our tomato and onion slice be so thick? I am at a loss! I will head into the kitchen now and have all of our cooks start cutting them more thinly! As the reviewer mentioned with his intro and conclusion, a restaurant experience is made up of details --and we need to get ours right! The pricing on the cheddar is also an issue. Although 45,- may seem like a bit over the top, we are using real cheddar cheese on our burgers. Many of our competitors are still using individually wrapped, low-grade cheese slices, or Eidam. Both of these options are much cheaper. We believe a good cheddar burger deserves an ample amount of the real thing (and that does cost a bit more!). 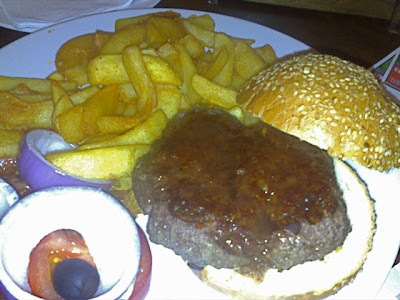 As for how the burger is cooked, our burger is made up of 100% fresh ground rumpsteak. Because the meat is of a high grade, the customer can ask to have it grilled to order (rare, medium-rare, medium, etc.) We do not want to serve an overcooked burger because it would be a shame. Instead, as we mention on the menu, each burger is grilled to medium (a bit pink inside) unless otherwise instructed. Yes, many if not most places cook their burgers to medium-well, but they may be using lower quality beef (if not a beef and pork mix that is prevalent in the Czech Republic) and need to cook the meat more thouroughly. The bacon point is another good one, and thank you all for your comments there. I will make sure that the cooks cease using the "shortcut" mentioned above, even if it means investing in another grill. I also prefer bacon that has been properly done on the griddle to bacon that has been thrown in the deep fryer! If any of you have other comments or suggestions, please email them to me at max@jamapub.cz. And thank you again for the interest and pointers! Tasty, though. As are the wings although I do still pine for the Regent beer they used to serve. I've been going to Jama for years and have always enjoyed the burgers, which I think are the best in Prague (try the special Hamburger Menu on Tuesdays). Tex-Mex and steaks are also very good. Of course, they're not always perfect, and I don't hesitate to offer comments to Max and the staff where I think something could be improved (e.g., the new buns introduced last year are much better than the ones they were using before). Of all the places I go in Prague, I think Jama does the best job of listening to customers and making improvements, trying to strike the right menu balance between old favorites and new offerings. They must be doing something right to still be going strong after 14 years! This comment is meant for you; you seem to be the only one who can help me. I want a good reliable burger here in Prague. If you can give me a great one, even better. Charge me whatever it costs to serve it to me CONSISTENTLY; I'm not complaining about the price. The last three times I've been to Jama the burger has not been exciting. It's NEVER particularly bad, but it's been a year or two since it's been great. 1) Bun. I've eaten a LOT of burgers in this town. Number ONE complaint is that the buns here always break into smithereens on the first bite. Yours was NEVER like that until about last month. Tsk tsk. Go back to proper Czech bakery buns, not these thin flaky things I got served recently at Jama. Chef forgot to buy the nice ones yesterday? NOT acceptable. BOTH sides of the bun are to be toasted JUST before the burger is served. My last bun was only toasted on the top and it was toasted about 30 minutes before the burger was served; you know as well as I do that means the bottom part disintegrates and the top part makes the burger cold; yuck. 2) You've got your tomato slices perfect now; no wedges. I also like very much that you offer mustard for the burger. Yum. 3) Your [three?] raw onion rings are still ridiculously thick. I'd prefer proper classic thin cross sections, not two or three thick rings. Definitely not the inch-thick slices I've been getting lately. I LIKE raw onion; three inch-thick slices only serve to break the bun apart and are not very tasty. Jama offers one of the best value-for-money burgers in town. With only a little bit of effort on your part (even if it means a bit more money on our part), it can be a lot better, like it used to be. 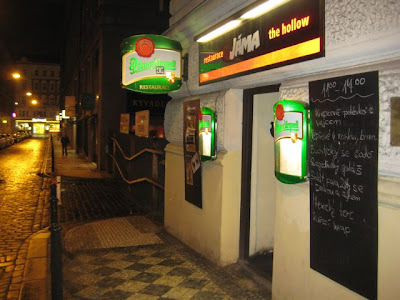 Jama was the scene of my worst dining experience in Prague to date, and i have lived here in excess of 4 years, which is less than some, but long enough to have been on the wrong end of some interesting czech interpretations of edible food! I recently visited with a friend for weekend brunch. Both meals were sub par. Partuicularly the steak and eggs I had the misfortune to order. The eggs were under cooked, which i appreciate was is probably a personal taste issue, however the quality of the steak was dreadful. The texture alone was enough to put me off. It tasted almost mechanically reconstituted. Just horrible. A very cheap excuse for a piece meat if ever i saw one. Neither my friend nor I were much inclined to finish our meals so we asked for the check. Now this is where it got particularly interesting. We both ordered from the brunch menu and therefore should have received a free coffee with our meals. Not only were we charged for the coffee we were also charged for the small tubs of accompanying milk! Seriously. Next thing you know the staff will be charging 100kc for cigarettes and taping match boxes to the packet!!! I thought this stupid bill padding went out with the ark! I didnt have the heart to complain. After all im fairly certain the waitress voided the milk and the coffees the minute we left the restaurant and pocketed a nice little tip for herself. Perhaps i should have caused a scene? Or then again maybe not. I voted with my feet. Never again. Oh and perhaps as Jama have a super computerised till the owner could have a look see just how many coffees and milks are voided from peoples bills during the brunch special... just a thought. At the end of the day, Jama still does the best wings in Prague, IMHO. The nuclear wings are fantastic. For those of you disappointed with Jama you need to make a return visit. I have had many meals from the lunch special and evening menu. Not once have i been let down.The burgers are voted 'best in Prague' on a regular basis. So it's not just me that enjoys them. There is a bacon cheese burger on the menu. The beer selection is always changing. Cerna Hora, Klaster, Lobkowicz, Jihlava breweries providing different tastes. All-in-all i enjoy my visits. The only negatives being it's sometimes over-crowded and smokey. So please try again.